Farmer Tom Crauford's renewed tenure over the aerodrome site was only to last four years. In 1922 the Royal Air Force began an expansion program headed by the Air Marshall Lord Trenchard, Sir Samuel Hoare and the Marquis of Salisbury. Once again the former landing ground at Sutton's Farm was chosen for the establishment of a two squadron airfield for fighter aircraft to form part of the planned defences for South East England and in particular London. In 1923, New College Oxford sold the land to the Royal Air Force and construction of the new facilities began the following year. The new aerodrome took nearly four years to be built but was finally opened as RAF Sutton's Farm on April 1st 1928. In July 1928 the aerodrome's name was changed to RAF Hornchurch, to make the aerodrome easier to find on public transport. The first operational squadron to arrive was 111 squadron equipped with Armstrong Whitworth Siskin III's and whose commanding officer as Squadron Leader Keith Park. Keith Park, was to earn lasting fame during the Battle of Britain as Air Vice Marshall in command of the heavily embattled 11 Group. Another famous aviator with 111 Squadron was Flying Officer Frank Whittle, who was later to pioneer British jet aviation. 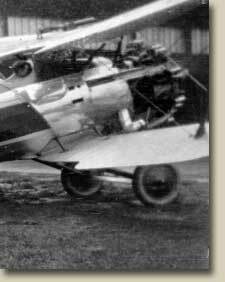 In 1929 111 Squadron was re equipped with the Gloster Gamecock. In January 1930 111 Squadron was joined at RAF Hornchurch by the Bristol Bulldog equipped 54 Squadron. In 1934 111 Squadron left RAF Hornchurch to be replaced by 65 Squadron, equipped with Hawker Demons. By this date RAF Hornchurch already had a personnel strength almost equivalent to its World War I maximum with nearly 30 Officers, 250 other ranks and 24 civilians. Throughout the halycon days of the early 1930's RAF Hornchurch was at the forefront of the development of a system of air control that had its origins in the defence of London during World War I and would finally bear fruit during the Battle of Britain. Hornchurch fliers experimented with the latest ground to air and air to air radio transmitting systems, new oxygen equipment and oxygen mask microphones. The squadrons at Hornchurch also trained in tight formation flying that would delight crowds at airshows such as the annual Empire Air Days. Alas, however the delight of these crowds was also practice for a grimmer purpose, for the long shadows of a coming storm were already gathering over Europe.